With rents on the rise in many of America’s trendiest cities it has become increasingly popular for residents looking to earn some side money to invest in the short-term rental market. Indeed, the returns these rental properties can offer are robust. But as more investors take their share of the rental market pie and offer it to incoming tourists, it leaves fewer options for local, long-term renters and causes rental prices to squeeze further upwards. In response, some cities like New York have started looking into regulating the short-term rental market, with their crosshairs focused primarily on Airbnb. 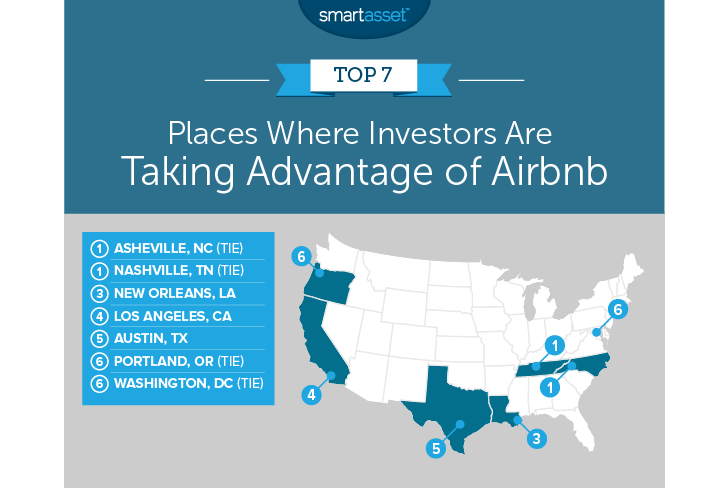 In order to take a closer look at this phenomenon, we decided to analyze Airbnb data to find the places where investors are taking advantage of Airbnb. To do this we examined Airbnb data for 17 cities. Next, we compared them across five total metrics looking at the percent of listings where the entire home/apartment is available, Airbnbs as a percent of local housing stock, Airbnb rate compared to local rents and the percent of very active Airbnb listings. Check out our data and methodology below to see where we got our data and how we put it together. And if you’re looking for specialized guidance on an investment property, consider using the SmartAsset matching tool to get paired with a financial advisor in your area. Southern tourist destinations are popular spots for Airbnbs – Asheville, Austin, Nashville and New Orleans all crack the top 7. Smaller cities are hit harder – Larger cities like New York, Chicago and San Francisco seem to be the least impacted by the Airbnb trend in our dataset. You are less likely to see entire homes listed there, and Airbnbs make up smaller portions of the available housing stock. Smaller cities like Ashville, Nashville and New Orleans crack the top three. In those cities it is extremely common to find listings for entire homes and those listings make up significant portions of the local housing stock. Asheville has become a very popular tourist spot for craft beer drinkers and nature lovers over the past few years. The number of passengers flying in and out of the Asheville regional airport increased by 400,000 between 2000 and 2017. All this extra economic activity has led to an increase in the cost of living, especially when it comes to rent. What’s more, from 2011 to 2016, the median gross rent increased from $759 per month to $923 per month according to Census Bureau estimates. Many investors have recognized this. Active Airbnb listings equal 3.2% of the overall housing stock in the city, and of these Airbnbs, 50% of them see at least three visitors per month. The average Airbnb in Asheville is available to rent for over half the year as well. Like Asheville, Nashville is a popular tourist spot, in particular for fans of music. Part of the charm of visiting Nashville is all the local music artists. In fact, the music scene is so big we recently ranked it as one of the best metro areas in the country for creatives. This tourist market has become so lucrative many investors are buying entire homes to rent on a short-term basis here. According to our analysis, 83% of active listings on Airbnb in Nashville are for the entire home, the second-highest rate in our study. Active Airbnbs here are also much more expensive than the typical rental. According to our data an active Airbnb costs 5.8 times as much to stay in compared to a local long-term rental. So that suggests Airbnb hosts are raising prices high above local rents in an attempt to make more money. Another extremely popular southern tourist destination ranks highly as a place where Airbnb hosts are taking advantage of the local housing market. One sign that people are investing in the Airbnb market rather than just renting out a room in their home is the chance that a listing is for an entire home. While it could be argued that families list their entire home on Airbnb only when they go on vacation, causing no damage to the local housing market, it is unlikely that is the case in New Orleans. In the Big Easy, 84% of active Airbnb listings are for an entire home, the largest share in our study. In fact, active Airbnb listings make up 2.4% of the local housing stock as well, the second-most in our study. The renting situation is dire for many Los Angelenos. The Census Bureau estimates that 281,300 renting households out of a total of 884,300 spend over 50% of their income on housing. In fact, one problem for these individuals is the potential money earned from renting is sky rocketing. From 2011 to 2016, the median gross rent in Los Angeles increased from $1,135 per month to $1,315 per month. This has made L.A. a lucrative place to own and operate an Airbnb. The Airbnb market in L.A. is pretty sizable being worth 1.5% of local housing stock. At the same time, 65% of active Airbnb listings are for an entire apartment or home and are available for around half the year. Texas’ capital is the only Texas city in our sample. Compared to other cities, Airbnbs here are likely to be listed as entire homes, have wide availability and be expensive relative to the local market. These three signs point to owning and operating an Airbnb as a side hustle to be fairly popular and possibly lucrative. 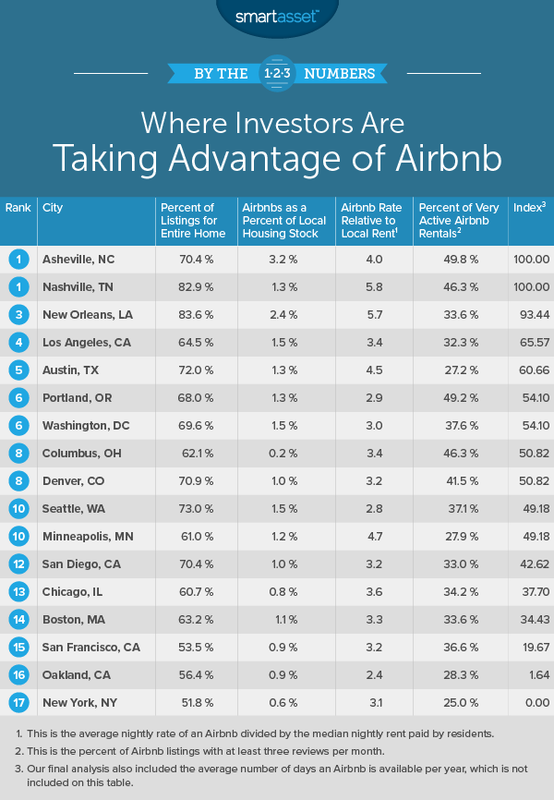 The one metric dragging Austin down the ranking is the lack of very active Airbnbs. Only 27% of Airbnbs in Austin see at least three guests per month. Our last two cities are tied for sixth. Up first is Portland, Oregon. Only 68% of active rentals here are for the entire home/apartment, a below average rank. However the Airbnbs that are available tend to be very popular. According to our data nearly 50% of Airbnbs in Portland see at least three guests per month. Airbnbs hosts occupy homes which make up around 1.3% of all housing stock in Portland. The nation’s capital takes the last spot. This is one of America’s premier tourist destinations with its world class museums and monuments. It attracts not only domestic tourists, but international ones as well. This has made Airbnb hosting a potentially lucrative gig and many investors have responded in kind. Around 70% of all Airbnbs in D.C. are for the entire home and 38% of Airbnbs are very active. About one in 65 homes in Washington D.C. are listed as active Airbnbs. Percent of listings for entire home. This is the percent of listings that are listed as entire home/apartment is available. Data comes from InsideAirbnb.com and is the most up to date listing for each city. Airbnbs as a percent of local housing stock. This is total number of Airbnb listings divided by the total number of housing units. Data comes from InsideAirbnb.com and is the most up to date listing for each city. Data on housing units comes from the Census Bureau’s 2016 1-year American Community Survey. Airbnb rate relative to local rent. This is the average daily price for renting an Airbnb divided by average daily price of local gross rent. Data comes from InsideAirbnb.com and is the most up to date listing for each city. Data on local rents comes from the Census Bureau’s 1-year American Community Survey. Percent of very active airbnb rentals. The is the percent of Airbnb listings which are rented out at least three times per month. Data comes from InsideAirbnb.com and is the most up to date listing for each city. Average available days per Airbnb. This is the number of days the average Airbnb is available to be rented. Data comes from InsideAirbnb.com and is the most up to date listing for each city. To create our final score we first ranked each city in each metro. We then found each city’s average ranking giving equal weight to each metric. Using this average ranking we gave a score to each city. The city with the best average ranking received a 100 the city with the worst average ranking received a 0. Take your time – No matter if you are a long-time resident or a newcomer, it is a good idea to take your time searching the homebuying market. Your home likely the single largest purchaser you will ever make in your life and any mistake will cost you. So if you are new to a city and worried you are losing money by not investing in homeownership, you may be wrong. Depending on how long you plan on staying in a city renting may offer a larger payoff than buying. Our rent vs. buy calculator can help you with the specifics. Don’t just look at the sticker price – Your mortgage will make up most of your housing costs. However, there are other considerations which you need to budget in. For example property taxes can cost hundreds or even thousands of dollars per month depending on where you live and how much your home is worth. Ask an expert – As mentioned, your home is likely the biggest purchase you will ever make in your life. So why take any chances? Get the best advice. A local financial advisor can show you how homeownership, investing and retirement planning all interact to make sure you are ready for a financially secure future. To find a local financial advisor check out SmartAsset’s financial advisor matching tool. It will match you with up to three local financial advisors who have expertise in your areas of need.